Templates are preconfigured images of your VMs that help you to easily deploy multiple copies of the model VMs across the infrastructure. This report provides information on VM templates that have not been used for the specified period. 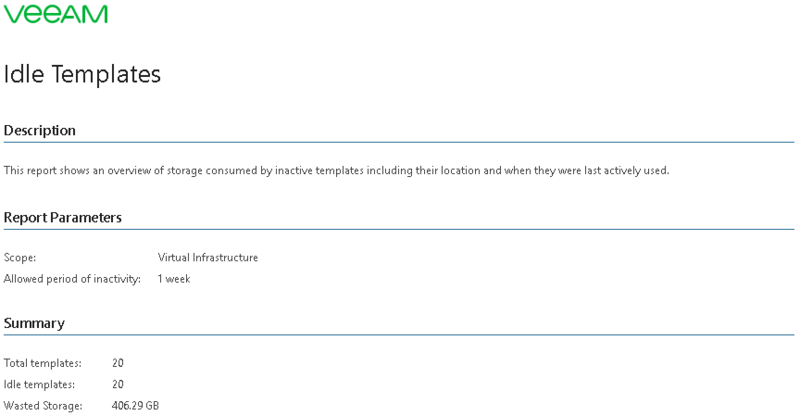 For each inactive template, the report shows its location, size and the last time the template was used. VM templates consume valuable storage resources. Use this report to review the list of your templates and identify templates that can be deleted or moved to less costly datastores to reclaim additional storage space. Inactive Interval - Interval Type: defines the amount of time that the template must be inactive to be included in the report. You can exclude specific datastores from this report. This can be useful when you are not interested in examining particular datastores for garbage files (for example, local datastores, datastores hosting ISO files or backups). In this case, you can exclude unnecessary datastores from the collection scope. For more information, see Choosing Datastores to Report On.